(a) Morlet wavelet of arbitrary width and amplitude, with time along the x-axis. (b) Construction of the Morlet wavelet (blue dashed) as a Sine curve (green) modulated by a Gaussian (red). 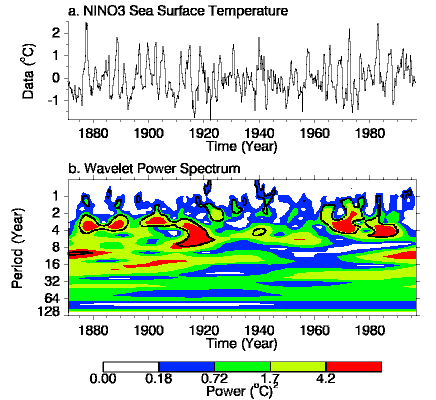 (a) Time series of El Niño sea surface temperature. (b) The wavelet power spectrum, using the Morlet wavelet. The x-axis is the wavelet location in time. The y-axis is the wavelet period in years. The black contours are the 10% significance regions, using a red-noise background spectrum. The red areas indicate that high El Niño activity occurred during 1880-1920 and 1965-present, while 1920-1960 was relatively calm.